Keeping the air clean in your home is important. It is the task that one can never ignore or take lightly. It is important for the health of your family. 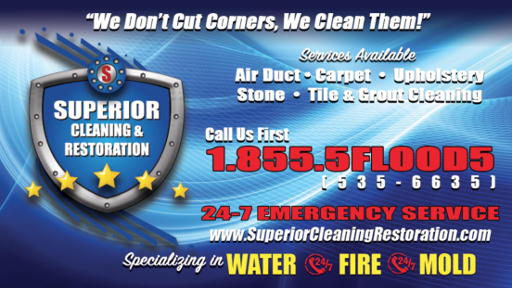 You can achieve good health for your family free from allergies and respiratory problems by getting your air ducts cleaned by Superior Cleaning and Restoration Inc. Temecula. Air duct cleaning provides you with better indoor air to breathe and less chances of getting asthma and other respiratory allergies. It also increases the life span of your HVAC system. Moist, dark heating and air conditioning fuel the growth of bacteria, mold, fungus, mildew and dust mites. Since these ducts are used to regulate the temperature in your house, the risk of spreading these dangerous agents increases significantly. Due to the accumulated dirt in the ducts, the filters become filthy and the ventilation becomes poor not allowing the fresh air from outside to enter indoors further degrading the environment of the house. We use a truck mount duct cleaning system. We thoroughly remove and sanitize every vent cover, agitate all ducts with a Roto-Brush cleaning unit, and vacuum the entire system clean. Air duct cleaning is an important way to maintain a healthy environment in your house it however, is not enough. You also need to get your vents cleaned to help prevent asthma, allergies and other respiration related issues. A thorough cleaning of your HVAC system will eliminate dust, pollen and mold. This measure not only eradicates harmful substances but also increases the life span of your HVAC system. The air ducts play an important role in maintaining the health of your family and the heating and cooling system in your house, it is therefore recommended to get them cleaned annually at least once. Air duct cleaning is an essential step for the good health of your family and it should be taken seriously. We have a team of trained professionals; avail our services and see the difference for yourself. We care about your health.